It’s hard to find the right foot support when you’re flat-footed, especially when it comes to heavy duty work boots. Funny thing is that’s when you need the support the most - when you’re on your feet all day at work. That’s why we researched the best men's work boots for flat feet and put together this buying guide to help you find the right boots for the job. Before we get started, here are some key things to keep in mind. Type: We included 2 types of boots on our list, those that tie and those that pull on. Most tie up the front so you can tighten the fit as needed but there are some really awesome pull-on styles as well. Color Options: Even though these are work boots, you still have some options when it comes to color. Most of the some in variations of brown and black but there are a few that have interesting finishes and textures. Rubber Sole: Some of our picks have rubber soles, some don’t. Generally, rubber soles are durable, non-slip, and resistant to oil but there are some synthetic materials that are nearly as effective. We included details each review when possible. Waterproof: There are a few products on our list that are truly waterproof but most of them are considered water resistant. Waterproof boots are usually submersible when you’re wearing them while water-resistant boots can tolerate a bit of rain or splash. EVA Midsole: EVA midsoles provide the right amount of cushioning and shock absorption to give your feet the support they need, especially when you’re on your feet all day. Other materials that can do the job but EVA is the standard. Weight: Keep in mind that these are work boots and are pretty heavy. You don’t want them to be too heavy, though, so they’re still comfortable to work in. These boot range from a lightweight 10.4 ounces up to 5 pounds. Now that you know what to look for, let’s move into our reviews. Here’s the deal, we put our top and budget picks right at the top of the list so you’ll be sure to see them, even if you’re in a hurry. That’s the best way to get an idea of the range that’s available so you don’t want to miss them. All of our picks are great work boots for flat feet so stick around if you can. Okay, let’s go! Our pick for the top work boots for flat feet is the Red Wing Heritage Boot. This style is actually modeled after the brand’s original work boot style from way back in the 1950s and has a lot of high-quality details like Oro legacy leather, Norwegian-like welt, leather laces, and triple stitched construction. The standout feature on these boots is the crescent-shaped toe which was actually inspired by moccasins originally worn by the Algonquin Indians. The leather is water, stain, and sweat proof and has a really natural finish. While these boots may be a little stiff at first, they’re designed to mold to your foot over time and will ultimately give you the customized support your flat feet need. 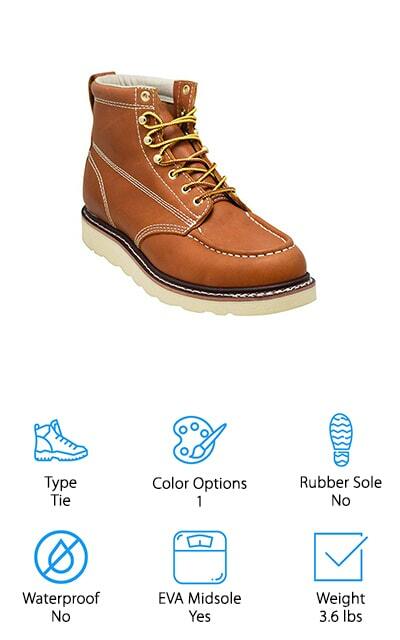 As for sizing, Red Wing suggests going down by ½ size. A great pair of work boots for the money is the Sketchers Canopy Work Boot. The upper is made of leather, synthetic, and Cordura mesh is textured and lightly distressed to add a little style. It’s scuff-resistant so you don’t have to worry about ruining the look no matter what you put these boots through. There are even some ventilation holes to help keep your feet cool. 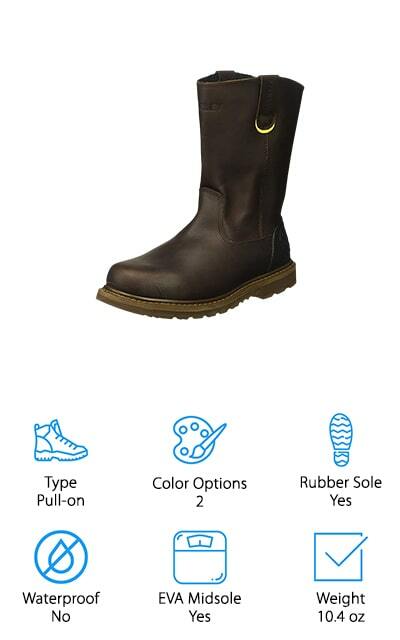 A composite safety toe and OSHA compliant slip-resistant rubber soles are ideal for most work environments. That’s not all, they’re really comfortable, too. Inside is a memory foam insole that contours to the shape of your foot and provides comfort and support with every step. The lace-up front gives these boots a sneaker-like look so they’re also suitable for more casual wear. Another pair of good work boots for flat feet is the Timberland PRO Boondock Boots. It’s not surprised to see Timberland on our list, they’re famous for their workboots and have been making them since 1973 and focuses especially on boots for the outdoors. That’s one reason why these boots are great. First of all, they just look like a serious boot. The uppers are made of 100% leather that’s completely waterproof and there’s even a waterproof membrane for extra protection. 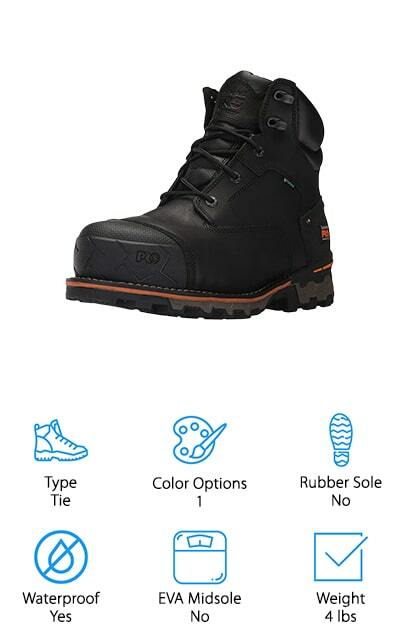 For added safety on the job site, you get a molded rubber toe protector as well as rugged weather-ready outsoles that are great even in snow, ice, or any cold weather. The polyurethane footbed as an anti-fatigue design that really helps during those long days on your feet at the job site. For something a little different, check out the Stanley Dropper Work Boot. This pull-on design is comfortable right out of the box. That’s right - there’s no break-in period. The 100% leather uppers are mesh lined and come up to just below the calf. 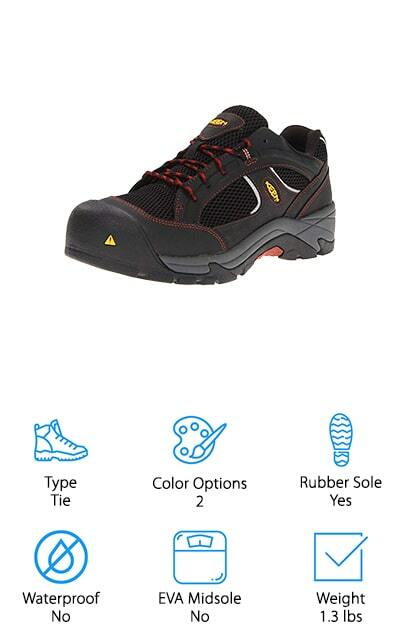 The flexible rubber sole is slip, oil, and acid resistant so they’re great for just about any work environment. A TPU heel counter adds additional protection and the EVA footbed provides excellent shock absorption and cushioning. Overall, these boots are extremely durable, easy to clean and feature a soft toe, ultra-lightweight design that’s super comfortable. Plus, if you don’t like the support the insole gives you, it’s completely removable so you can put any aftermarket product to make sure your feet get just the right amount of support. Dr. Martens is one of the most well-known boot brands around and their Icon Steel Toe Boot is a perfect example of why. 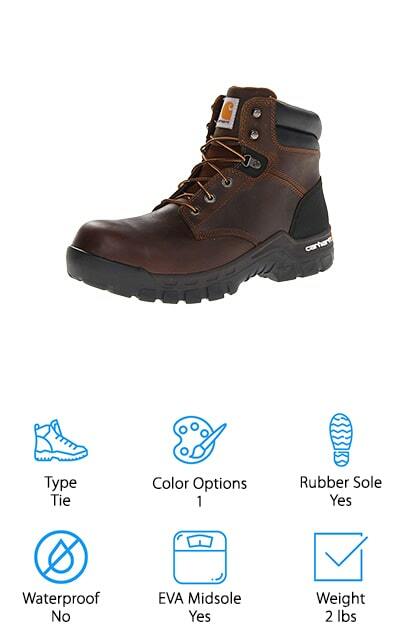 They’re also our pick for best steel toe work boots for flat feet because they’re ANSI approved to protect against falling objects and other potential hazards on the job site. These boots feature a 100% leather upper that’s about 12-inches high with stylish and practical pull-on loops to help you get them on your feet quickly. The heat-sealed welted construction is super durable, too. Slip-resistant outsoles are great for any environment and, get this, they’re even electric hazard-resistant for extra protection. What’s really special about these boots is what’s on the inside. The AirWave midsoles are soft and provide the perfect cushion for all-day comfort. Up next is the Carhartt CMF6366 Work Boot. The thing that’s really special about these is the outsole. It uses the brands unique Rugged Flex technology that moves and stretches with your feet throughout the day, keeping you both comfortable and supported. The 100% rubber sole is a perfect choice for indoor and outdoor use plus it has shock absorbing traction that’s suitable for in any environment. There’s more, the outsoles are also oil and chemical resistant that provide additional protection no matter what you’re up against at work. The 100% leather upper has a padded tongue and collar that keeps your foot comfortable and protects your ankles while providing the support you need. The brown, oil-tanned leather has a worn, professional look that would even be appropriate for casual wear, too. If you’re looking for a pair of work boots that have the look of an athletic shoe, check out the Keen Albany Work Boot. Sometimes, you just don’t need a high boot so if you want something low cut and really comfortable, this pair is for you. Though the shoes themselves aren’t waterproof, the nubuck leather upper is which will help in most situations. These shoes also feature breathable mesh panels that will keep your feet dry and comfortable while you work. Asymmetrical composite toes provide added protection against falling objects and other worksite hazards and the non-making rubber outsoles are also rated oil and slip resistant. Inside, there’s a polyurethane shank for arch support. These boots are extremely comfortable and much lighter than most of the other products we reviewed. Another pair of comfortable work boots for flat feet is the Goldern Fox Work Boots. The durable, water-resistant full grain leather upper might feel a little stiff at first but it’s designed to soften with wear as it contours to the shape of your feet. The anti-fatigue dual density insole is comfortable and supportive plus the shock-absorbing heel supports your lower back and legs to keep the rest of you comfortable, too. Inside, the insulated fabric keeps you warm on very cold days and wicks away moisture to help prevent odors. Plus, they’re put together using Goodyear Welt Industrial Workboot Construction which prevents the sole from separating and also allows means they can be resoled. One more thing about the sole, it’s made of lightweight polyurethane that’s infused with air for a lightweight, flexible fit. ROCKROOSTER Work Boots are a great pick for men’s work boots for flat feet. A TPU rubber compound outsole is slip resistant and designed for superior grip. It also has a Kevlar puncture-resistant plate so that the outsole won’t be punctured if you step on a nail while on the job. Inside this boot, a PORON insole uses microban technology for antimicrobial protection to prevent odors from occurring. The insole is also designed to help wick moisture away from your feet so you stay dry and comfortable while you work. NANO technology cushions and massages your feet as you walk, reducing fatigue and providing the support your need for your flat feet. These boots also feature a composite toe that provides protection from work hazards and the full-grain tumbled leather upper that’s completely waterproof. Our last pick is this construction boot from EVER BOOTS. The full-grain leather uppers feel great right out of the box but once you give them time to wear in, the soft leather forms to your foot providing the right amount of support and comfort. Because these boots use Goodyear Welt Construction and have toe stitch reinforcement, they’re really strong and durable plus you can replace the sole when and if it wears out. That’s not all, the sole is oil and slip resistant, too. Inside, the unlined leather helps manage heat and the padded collar provides a little more support and comfort for your ankle. One of the great things about these boots is they’re durable enough for work but are also stylish enough to wear out and about casually.